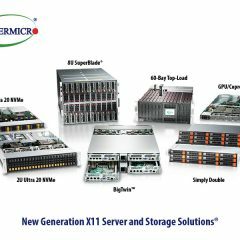 Computex 2016, Supermicro exhibited the industry’s broadest range of NVMe server/storage solutions. 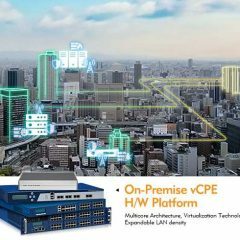 For growing performance, efficiency, density and manageability demands across Enterprise, Cloud, HPC and Embedded IoT infrastructure environments. Exhibits include the industry’s broadest range on NVMe server/storage solutions, 2U Ultra, 2U TwinPro, 4U FatTwin series SuperServers, 3U MicroCloud, 6U/3U MicroBlade, and Embedded IoT products. Additional products featured include UP motherboards supporting the Intel® Xeon® processor E5-2600/1600 v4 and v3 product families, Intel® Xeon® processor E3-1200 v5 product family, Intel® Xeon® E3-1500 v5 family, Intel® Xeon® processor D-1500 product family, 6th Generation Intel® Core™ i7/i5/i3 processor families, and Intel® Atom™ processor family; DP motherboards supporting Intel® Xeon® processor E5-2600 v4 product family, Intel® Xeon Phi™ coprocessor based systems, 1/10/25/40/100GbE and Intel® Omni-Path Architecture 100G network switches Server Management Software and server-class gaming systems. NVM Express (NVMe) or Non-Volatile Memory Host Controller Interface Specification (NVMHCI) is a logical device interface specification for accessing non-volatile storage media attached via PCI Express (PCIe) bus. “NVM” stands as an initialism for “non-volatile memory”, which is commonly flash memory that comes in the form of SSDs. NVM Express, as a logical device interface, has been designed from the ground up to capitalize on the low latency and internal parallelism of flash-based storage devices, mirroring the parallelism of contemporary CPUs, platforms and applications. By its design, NVM Express allows levels of parallelism found in modern SSDs to be fully utilized by the host hardware and software. As a result, NVM Express reduces I/O overhead and brings various performance improvements in comparison to previous logical device interfaces, including multiple, long command queues, and reduced latency. Within the new solutions is a new 7U 8-Way MP SuperServer® and 3U MicroBlade systems with extreme compute density, supporting up to 14x Intel® Xeon® processor E5-2600 v4 family DP servers. 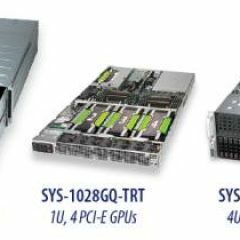 Their latest SuperStorage architecture innovations include the 2U Simply Double solutions supporting 48x hot-swap 2.5” NVMe and SAS SSD bays or 24x 3.5” HDD bays and 4U 90/60x 3.5” top-load, hot-swap SAS3 full redundancy SuperStorage systems in server or JBOD configurations. 8-Way (MP) SuperServer® 7U Latest generation Supermicro 8-Way multi-processor (MP) system features 8x CPU modules and 2x storage modules. Each CPU module supports future Intel® Xeon® product family (former codename Broadwell-EX), and Intel® Xeon® processor E7-8800 v3 product family w/ QPI up to 9.6 GT/s, up to 24x DDR4 memory DIMMs (total 192x DDR4 DIMMs for complete system), 1x PCI-E 3.0 (x16) (GPU supported) or optional 2x 2.5” hot-swap U.2 NVMe. 2x storage modules each supporting 6x hot-swap 2.5” HDD/SSD, 3x 3.5” HDD or optional 10x 2.5” HDD/SSD, and 1x PCI-E (x8 in x16) and optional RAID card. Chassis supports 5x rear hot-plug FHHL PCI-E 3.0 (x8 in x16) modules, SIOM expansion with 4x 10GbE and 1x 1GbE IPMI ports, and 5x redundant (N+1) 1600W Titanium Level high efficiency (96%+) power supplies. Solution is optimized for mission-critical workloads in scale-up HPC, in-memory computing, and large-scale virtualization. SuperBlade® 7U Advantages include maximum density with 20 DP nodes in 7U, affordability, reduced management costs, lower power consumption, optimal ROI, and high scalability. Modules support latest Intel® Xeon® Processor E5-2600 v4 product family and are available in 20 GPU/ Intel® Xeon Phi® coprocessor Blade; 2x NVIDIA® Tesla®, NVIDIA® M40, M60, K80 or Intel® Xeon Phi™ coprocessor cards per blade server (SBI-7128RG-X/-F/-F2), 3x NVIDIA Tesla® GPU per blade server (SBI-7127RG3), Data Center Blade (SBI-7428R-C3N, SBI-7428R-T3N), TwinBlade® (SBI-7228R-T2F/-T2F2/-T2X), Storage Blade with NVMe support (SBI-7128R-C6N) solutions. Chassis feature industry’s only hot-swap NVMe solutions, hot-plug switch modules supporting InfiniBand FDR/QDR, 10/1 GbE, FCoE, chassis management module (CMM) and redundant 3000W/2500W/1620W (N+1, N+N), hot-swap Platinum Level digital power supplies. All-Flash NVMe SuperStorage Solutions All Unrivaled for the widest variety of systems in the industry. 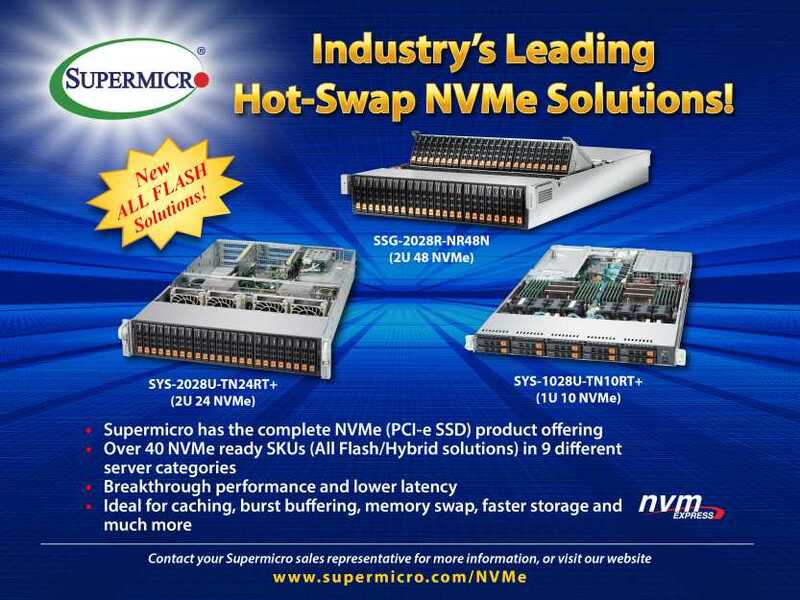 Supermicro server solutions with NVMe target HPC, Oil and Gas, 3D modeling and Graphical design workstation, HFT, SQL Database, Search Engine, High Security Encryption datacenter, VDI, Aerospace and Automobile design center, Cluster and Supercomputer applications; in Cloud, Virtualization, and Enterprise environments. Benefits include large throughput gains (6x), substantial latency improvements (7x), shared common backplane improves flexibility of drive choice, 2.5″ U.2 (SFF-8639) form factor for improved serviceability vs. PCI-E Flash cards (hot-swap), Improved power efficiency. GPU Solutions All Accelerator-based Solutions – Supermicro’s Enterprise-class High Performance SuperComputing solutions are available in the industry’s broadest form factors and highest density (1U, 4x Pascal SYS-1028GQ-TXR/-TXRT) generating massively parallel processing power and unrivaled GPU peering via 80GB/s NVLINK for Machine Learning applications. Solutions support the latest NVIDIA Tesla M10/M40/M60 and the Pascal Tesla P100 GPU accelerators. 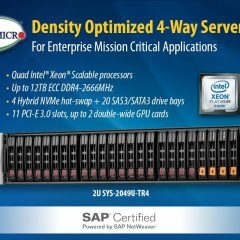 Intel® Xeon Phi™ All Coprocessor-based Solutions – Supermicro’s Intel® Xeon Phi™ coprocessor-based computing platforms achieve higher parallel processing capability with Intel’s MIC (Many Integrated Core) architecture. 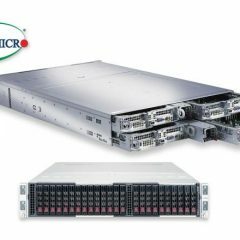 Unified with the latest Intel Xeon processors utilizing common instruction sets and Xeon Phi’s multiple programming models, it is easier to port parallel computing applications in the hybrid environment and take advantage of the powerful processing resources of Supermicro’s HPC platforms. Engineering, scientific and research fields can dramatically accelerate application performance with minimal investment in development with Supermicro’s Intel Xeon Phi™ based supercomputing solutions. Hybrid platforms support latest Intel® Xeon® processor E5-2600 v4 and v3 product families. Data Center Optimized (DCO) Solutions All Improved thermal architecture utilizes power efficient components, offset Intel® Xeon® processor E5-2600 v4 and v3 product family CPUs to help eliminate processor preheating, and highest-efficiency power supplies to allow higher operating temperatures offering the best performance-per-watt to lower overall Total Cost of Ownership (TCO) across Data Centers. SuperO® Gaming Solutions All Leveraging server-grade designs and components to deliver industry leading durability, stability and performance. Gaming motherboards and systems support 6thGeneration Intel® Core™ i7/i5/i3 processor families. Supermicro’s C7X99-OCE and SYS-5038AD-I will also support the new Intel® Core™ i7 X-Series Processor families.